Congratulations! You have a new puppy. You’ve begun that all-important bonding process and now you have to figure out which dog food to give him. After all, you have hundreds of choices. In 2017, the pet food industry in the US alone earned almost $70 billion. Yep, that’s billion with a “b.” No matter how you measure it, that’s a lot of money, and a lot of choices. If you’re like most pet owners, you already think of your new puppy as more than just a dog. He’s already made his way into your heart and become one of the family. Just as you would any member of your family, you want to feed him right, so you need to do a little research into what food would be best for your dog. One such quality food for your puppy comes from Merrick, a manufacturer of high-end, quality dog food. This particular product, the Grain Free Puppy Recipe from their line is an all natural, grain free, gluten free puppy food. Designed to provide optimal nutrition for your growing puppy, this might be one to consider. Manufacturers list ingredients on their packaging in descending order of quantity. That is, they place the ingredient they have used the most of at the top of the list and then list others by descending quantity. Dogs are meat eaters. They need protein and the healthy fats that meats provide. It’s good to note that the number one item in this ingredient list is deboned chicken. Dogs love meat of any kind and chicken is one of their favorites. Protein, especially in a young, developing puppy helps foster bone and muscle growth as well as increase energy. Another feature of this particular product is that it is free of grains. Many dogs have sensitivities to grains such as corn, wheat, soy, or gluten which act as fillers in some other dog foods. Over time, these fillers help promote grain sensitivities and other digestive problems in your pet. Merrick’s has no such fillers which helps to promote gastrointestinal health and digestion. In fact, they claim they have an ideally balanced pet food that contains 55 per cent poultry and fish proteins, and 45 per cent fresh produce, vitamins and minerals. Merrick’s puppy food also contains substantial levels of Omega 6 and Omega 3 fatty acids for healthy skin and coat as well as glucosamine and chondroitin for healthy hips and joints. Merrick cooks all its foods in organically certified kitchens and their ingredients come from local, organically certified farmers and they never use ingredients from China. 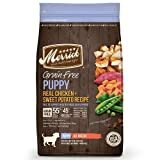 While most users report that their puppies of all breeds liked this dog food and thrived on it, a few have said that their dogs won’t eat it, or that they developed some diarrhea and vomiting while being fed Merrick’s. Others have said that while their puppy did well with the first bag, they either refused to eat the second bag, or developed diarrhea and vomiting when given food from subsequent bags. What transpired between the first and second bag is anyone’s guess. Maybe the dog just got tired of the taste or developed digestive issues along the way. Or perhaps the digestive issues came about because of individual differences or super-sensitive systems. A few have reported that among the mostly small kibbles of dog food, there are larger kibbles fused together and are very hard, making it difficult for the puppy to chew, so they had to pick those larger chunks out of the food dish. Overall, however, most people were satisfied with the product and continue to buy it for their pet. 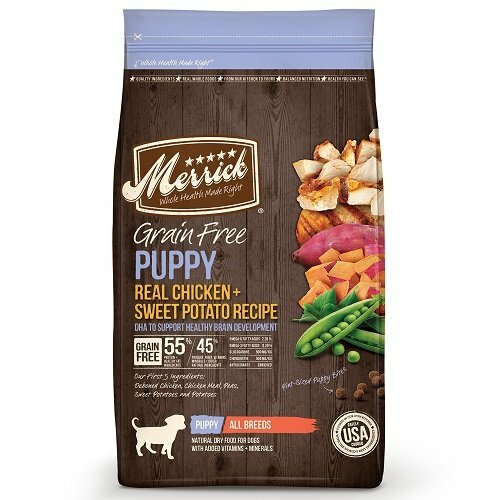 Merrick Grain Free Puppy Real Chicken & Sweet Potato Dry Dog Food, 4 lbs. You’ve heard the expression “you get what you pay for.” This is a true statement when referring to most things, and dog food is no exception. There is a wide spectrum of quality regarding dog food, both canned and dry. At one end of the spectrum you can buy inexpensive dog food with lots of grains, fillers and very little protein. Then of course, there are mid-grades of food with more protein and fewer fillers. At the other end of the spectrum you will find high quality dog foods. Merrick’s falls at this far end of high quality dog foods. The brand is known for the quality of their product and the nutrition it offers. Kennels and consumers also know they are very expensive but worth it if you can afford it. You know you want to give your family the best, but finances often place limitations on those desires. So, you can’t afford filet mignon every night. Like most of us, you serve nutritious meals of the caliber of meatloaf and mac and cheese and green beans. As the person who pays the bills and feeds your furry friend, make an informed decision. Learn what the best has to offer, then read labels and buy the one that most closely mimics the best and is one you can afford.